It’s been 14 days since I finished my first ever Whole30. I didn’t include everything in my last post as that mostly covered the final 10 days of the challenge. 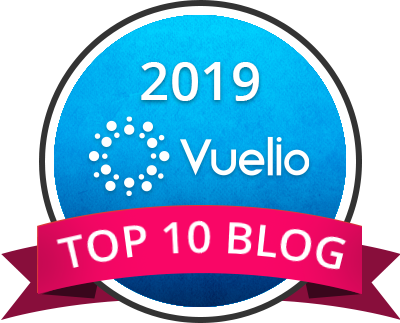 Now I’m ready to share with you the results in regards to my goals and what life has been like since. And I guess you wanna know if I achieved my goals, huh?! Let’s start with clearer skin. I can’t say I saw a change at all. This was probably the most disappointing thing for me in a sense but what it does show is that my diet is not what is causing my skin issues. Therefore, I will need to investigate other options maybe after speaking to a professional. Waking up feeling energised. This definitely did happen! I began waking up naturally around 6am…before my alarm. At some point, I started going to bed a little later as I had more energy and waking up around 7am. More hours mean more time to get things done! I do need to be more strict with myself about the snooze button though! I may go back to putting my alarm on the other side of the room so I have to get out of bed to turn it off! Reduce cravings and eliminate empty calories. This happened for sure! I went to just 3 meals a day rather than what had become normal for me – 3 meals a day plus plenty of snacking. I didn’t really crave junk food – I had huge cravings for pineapple which I fed! Closer to the end I did start to crave cookies though. I remedied this when the 30 days were complete. Reduce anaemia symptoms. It’s hard to tell the results of this one as I have been taking iron tablets since I hit a low earlier this year. I forget to take them some days though and haven’t felt this has been detrimental. My body isn’t showing signs of excess iron so I am happy I am getting just about enough right now. Training. I’ve survived crossfit sessions and even worked hard in them. I’ve done all this and not had to sleep for the rest of the day. My midriff is more toned since Whole30 and my abs are more visible! Who wouldn’t love that?! It’s motivated me to continue to train and keep up the good work. One massive benefit which I had forgotten about was my stomach issues. Late last year I ended up in hospital with a bleeding stomach after my doctor prescribed me some pills without giving me the medication that would protect my stomach at the same time. Ever since then, my stomach was never the same – anytime I got hungry I would have pain and it felt like my stomach was eating itself. I’m grateful that now, it seems my stomach has had the time to heal and so far I’ve had no tummy issues. According to the records, I lost 1.7kgs over the 30 days and 0.6% Body Fat. I also lost 1.5cm from my waist but nothing from anywhere else. 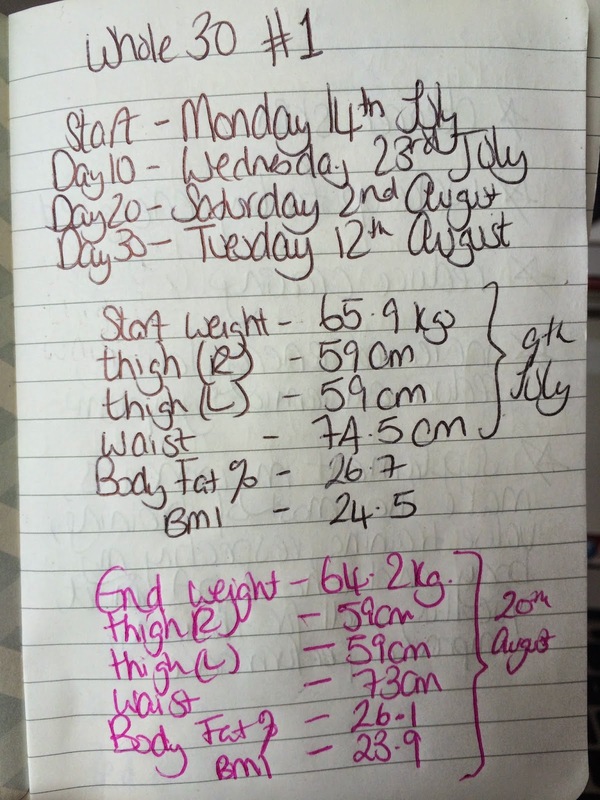 These changes show that waist measurement is linked to your diet…considering when I used Zaggora Hot Pants I only saw changes in my thighs and hips! Bear in mind though that these results are by no way scientific I’ve just sharing out of curiosity! I’ve chosen the 80/20 rule as a guideline to live by post Whole30. I’m still enjoying myself experimenting with Whole30 compliant recipes and home cooking has got me fully hooked! I’m happy to save a burrito from Benito’s Hat for a treat day…I’m even happier to make my own version of a burrito at home! FYI, I added white potatoes back into my diet on Day 30 at the wedding I attended. They were boiled and for the meal above they were steamed. All my meals are home cooked but I think I spend less time in the kitchen. A couple hours can see me prepare enough food for about 3 days. The accompaniments can literally be thrown together – i.e steaming some broccoli, sautéing some courgettes or chopping up a salad – maybe while I make breakfast or am warming up another meal. 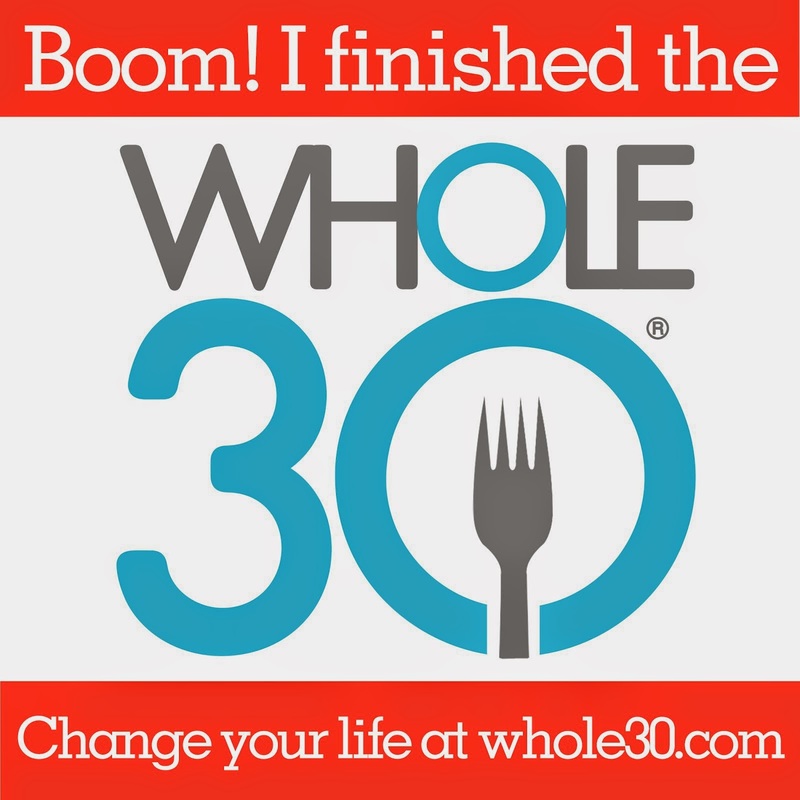 I’m not saying Whole30 is for everyone but I tried it and enjoyed it. I’d go as far as saying I found it pretty easy but that’s because I had made so many changes to my diet in the months leading up to starting this. I had the amazing support of good friend and housemate, Alicia who did it with me at the same time. Support from my mum who went all out to ensure my needs were met when I visited, and support from friends and bloggers who have done it before! A special Thanks to Leah for sharing her experiences in the first place and answering all my questions at the start! Thanks too to everyone in the Whole30 community especially on IG where I got a lot of inspiration for recipes and motivation!